From runic inscriptions to sagas, this book introduces readers to the colourful world of Old Norse-Icelandic literature. An introduction to the colourful world of Old Norse-Icelandic literature. Covers mythology and family sagas, as well as less well-known areas, such as oral story-telling, Eddaic verse and skaldic verse. An introduction helps readers to appreciate the language and culture of the first settlers in Iceland. Looks at the reception of Old-Norse-Icelandic literature over the ages, as views of the vikings have changed. Shows how a whole range of authors from Shakespeare to Seamus Heaney have been influenced by Old Norse-Icelandic literature. 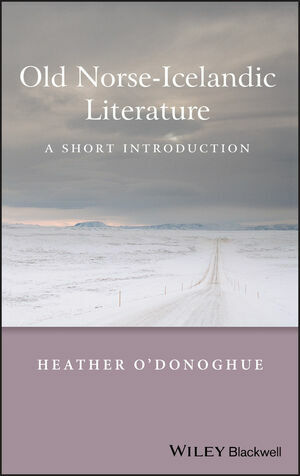 Heather O’Donoghue is Reader in Old Norse at Oxford University. She is a regular contributor to the Times Literary Supplement. Are Family Sagas Medieval Novels?. Are Family Sagas Chronicles of Times Past?. Three Extracts: Egils saga, Vatnsdœla saga and Laxdœla saga. 3. New Knowledge and Native Traditions. 4. The Politics of Old Norse-Icelandic Literature. Old Norse-Icelandic as ‘Ancient Poetry’. Old Norse-Icelandic Studies in Academia. The Debate about Saga Origins. Why is Old Norse English Literature?. Old Norse-Icelandic and English Medieval Literature. 5. The Influence of Old Norse-Icelandic Literature. MacDiarmid, Mackay Brown, and Auden and MacNeice.